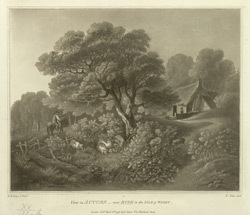 View by W. Brigg of a cottage in Ryde in the Isle of Wight. Located on the north east coast of the Island opposite Gosport on the South Coast of England. Ryde is well known for its sandy beaches and became popular in the 19th century as a tourist destination. Originally the town was a small fishing village separated from a small settlement further inland, these two areas were known as Ashley. In the late 18th century the Upper and Lower sections of the settlements were joined with the building of Union Street and from this time onwards the town grew rapidly becoming known as Ryde.